Twitter users: see the bottom of this article for details on how to win a copy of The Sausage Book. I love cookbooks and I’m not ashamed to admit it! I love the ideas you read and how it gets your imagination running. I also love the fact that more and more people are getting interested in cooking with and making sausages. In The Sausage Book Johnny Acton & Nick Sandler tap into this universal food passion and show you how to make over 30 different varieties of sausage using quality ingredients and no artificial preservatives. With delectable variations of British pork, Frankfurters, Merguez and Cotechino to dried sausages of Chorizo, Salami and Lap Cheong, there’s even a variety of fish and vegetarian options that even the most glamorous delicatessen would be proud of. From British Worcestershire Sauce Sausage Hotpot to provincial-style Toulouse Sausage & Bean Cassoulet, hearty stews of Rookwurst and Kale and light tapas-style Basque Sausage with Oysters, there are over 80 recipes showing you how to use your sausages, homemade or store-bought, as well as recipes for their raucous cousins; haggis, black pudding and Morcilla. Accompanied by historical and geographical information, as well as important safety advice, this A-Z compendium of sausages will make a compelling read as well as a useful cooking resource. Nick Sandler is Creative Chef for Pret A Manger and a freelance development chef. He has tested a vast range of sausages in the name of research, lovingly curing them in his hand-built home smoker. Johnny Acton is a writer/journalist who’s raised four Oxford Sandy and Blacks so far! Nick and Johnny have written five books for Kyle Cathie – Soup, Mushroom, Duchy Originals Cookbook and The Branded Cookbook. 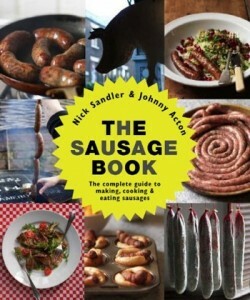 Sausagefans.co.uk have two copies of The Sausage Book to give away. To win one you just need to follow @sausagekinguk on twitter (if you don’t already) and then put a comment on this article with your twitter username. I will randomly select two lucky winners from followers who comment. I wouldn’t mind a good sausage book – am busy experimenting with all manner of German sausages at the moment (so to speak). We’ve are just purchased our first small holding and will be moving in October. Ive been planning for many years on what we would do, and number 2 on the list (beneath chooks), is pigs. I haven’t brought pork (or related) products from a supermarket in 2 years, i use a couple of farms in devon who keep me supplied with the tastiest bacon, sausage and joints etc. This book looks fantastic, if im not lucky to win a copy i would certainly look to purchase one. As I love sausages it would be nice to have a book about sausages and Sausage King doing a great job talking about sausages. I love sausages and always on the search for the best, would love a copy of this book to give me some pointers in my quest. Never made my own sausages. Think I will give it a go. This has to be the best sausage book published for years! Looks great, would love to review this for our consumer website and magazine. Would love a copy of this book. Really want a good black pudding recipe to try! Living in the US, the range of available sausages is poor. 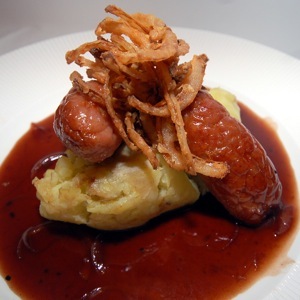 Would be good to have some basic recipes to prepare & then cook some decent British-style sausages. This book is definitely going to be a welcome addition to my small collection on british charcuterie. I have bangers down and like my tomato sausage, but I NEED more! Hi! Can’t even remember what you did with the interview? Are you there this year? Who wouldn’t want a lovely book about sausages? Mmmm, two of my favorite things in one package… sausages and books! I have a friend who is literally obsessed by sausages. She is however unaware of this website and I will get massive brownie points for notifying her of this treat! Who else gets over joyed by getting sausages for their birthday?! !